Front grill has a new cloth. sounds GR 8 ! 120 VOLTS MODEL - NOT SWITCHABLE = YOU HAVE TO BUY A STEP UP CONVERTER YOURSELF ! 4 x new blue Jensen 10" speakers. Der Schalter funktioniert einwandfrei. Original 70s Fender Fußschalter. Zum Thema Sachmängelhaftung nach § 438 I Nr. 3 BGB: Dieser Paragraph besagt, dass ein Verkäufer 12 Monate bei gebrauchten Sachen und 24 Monate bei neuen Sachen für Sachmängel haften muss. "Because Music Should be Made with Gear!". -Works perfectly, no functional issues (both channels, bright switches, reverb and vibrato all work great). This is why we exist at Nashville Gear Factory. We are heart broken by the reality that children are growing up believing that music magically appears out of a robotic cylinder. 3 of the speakers are original, 1 was swapped out long ago with an Eminence. Jewel light is blue. Has both original kick back amp stand legs in working order. No issues whatsoever and sounds like records. 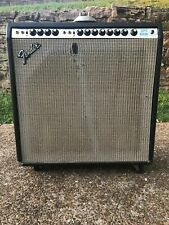 1966 Fender Super Reverb 4x10 Combo Amp! Model: Super Reverb 4x10 Combo Amp. 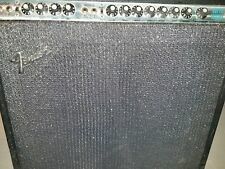 Up for sale is a fabulous sounding and clean 1966 Fender Super Reverb 4×10 Blackface combo amplifier. The tube chart is stamped PH dating to August 1966. There are no date codes on the speakers but they are indeed original. Up for sale, a 1974 Fender Super Reverb in excellent condition and in perfect working order. The amp is dynamic, detailed, and able to hold its own in any ensemble, boasting both lush tube driven spring reverb and a vibrato circuit that has a wide range of speeds for everything from a subtle pulse to machine gun chop. 1965 Fender Super Reverb amplifier in good condition for it's age Fender amp crover new 220 to 110v converter. Model:SUPER REVERB AMP AB763/110V. Fender Vintage Reissue 65 Super Reverb 4x10 Combo Amplifier 1010. 1973 Fender Super Reverb Silverface original Fender cover new 220 to 110 converter. Very good condition.All functions tested and operational and the sound great. All original,but one speaker change(CTS ALNICO SPEAKER DATE 1971). Up for saleFender Super Reverb from1973. The Amp has several modifications, but the previous owner was very aware. Two sets of speakers perfectly matched: 2 xOxford 10L6-1 and 2 xAlnico. Amp is serviced and sounds fantastic. Fender Super Reverb from 1975 - rarely used, no mods! Original reverb. Up for sale Fender Super Reverb from 1975 ! Japanese products, I can help you! This is a Receiving orders. From Hiroshima, Far east island Japan! Fender® Super Reverb Pro Reverb & Bandmaster Reverb TUBE SET by TUBE AMP DOCTOR. A strong driver tube and a wounderfully rich-sounding reverb driver. This is the ubiquitous 12AX7 with premium selection. This ATA case is custom designed to fit the Fender Super Reverb. REAL SUPPORT. The best in the industry! (1) T-6L6GC-JJ-MP (Apex Matched), which includes Part Number: SET-FENDER-027_JJ_MGS. (2) T-12AT7-JJ. (1) T-6L6GC-JJ-MP (Apex Matched), which includes Part Number: SET-FENDER-093_JJ_MGS. (4) T-12AX7-S-JJ This tube has a well balanced, colorful tone with strongly defined lows, mids and smooth highs. It allows for more clean head-room than higher gain 12AX7s. In overdrive, it is smooth and strong with well defined lows and mids. 1966 Fender Super Reverb Tube Amp AB763 Amplifier Circuit Diagram. This diagram is in form of electronic file, PDF format, black and white, 4 page, and size - 4.3Mb. Shorting Plug for Vintage Fender Super Reverb Amp, No Need for a Footswitch! Turn down the vibrato speed and intensity knobs in order to turn off the vibrato. This is a Switchcraft RCA plug that is the correct size to allow you to lay your amp on its back during transport. It's simple and economical. Vintage Fender tone again! WORLDWIDE SHIPPING!!! Matched Sets to Make Your Fender Sing! SHIPS WORLDWIDE! This kit includes all highest-quality new German made F&T electrolytic capacitors. This kit includes the following FREE Trial! 1- F & T 100uf 100VDC. JJ/Tesla Brand includes: (4) T-12AX7-S-JJ (1) T-5AR4-JJ (1) T-6L6GC-JJ-MP (Apex Matched), which includes: (2) T-6L6GC-JJ (2) T-12AT7-JJ . The Lot of 3 Footswitches/Pedals are pre-owned and in good working condition. We take great pride in properly representing each item that we have for sale. Depending on the style of music you play we have a tube set that will fit your needs. Super Six Reverb. If you need genuine parts from the manufacturer of your amplifier, check for authorized dealers and distributors via the manufacturer’s website. Tired of carrying or having to use the footswitch with your Fender '65 Super Reverb Re-issue just to turn on the Reverb and Tremolo (Speed/Intensity)?. Does not work for '65 Princeton Reverb RI. (Different circuit -- On Princeton Reverb, simply turn on your amp, plug the pedal in, step on the foot switch to turn the functions on, then unplug the pedal. ). Features RCA plug and 12-foot cable. OUR PLEDGE. Designed to fit '65 Super Reverb Reissue amplifiers manufactured 2001-Present. Also fits '93 Super. NEW - GENUINE FENDER AMP COVER. Other alphabets (Cyrillic, Japanese, Chinese, etc.) will not be translated and your item will be delayed. Bandmaster Reverb: AA1069. This Recap Kit includes full-color, easy to follow instructions and the following parts INQUIRE FOR CUSTOM RECAP KITS . Twin Reverb: AA270, AA769, AB763. Pro Reverb: AA165, AA1069. It has RCA plugs. Model number 0994051000. JJ premium Tube Set for Fender Super Reverb, Pro Reverb, & Bandmaster Reverb !! Tube Set for Fender Super Reverb, Pro Reverb, & Bandmaster Reverb. All are JJ Electronics tubes. Includes power and pre-amp tubes only. Rectifier tubes vary by year of model and tend to last much longer than other tube types. This item is very easy to use. Simply plug in this "Always On" plug, and leave the pedal in a drawer. Colour: Silver. Type: Plug. Item Details Data & Sizing Other Information. Everything included in the sale is photographed. Old Bandmaster Reverb Amp 5005 D faceplate. it is straight. 100% original. Authentic 1960s OEMFender black skirted knob with set screw from a1965 Super Reverb. Ready to put on your Princeton, Deluxe, Champ, Vibrolux, Super Reverb, Pro, Concert, Vibroverb, Twin Reverb, Tremolux, Bandmaster, Bassman, Showman, etc. Kit includes 48" cable with 226 plug, 2 x 14" cable, 1 x 6" cable and 3 x wire tie. The MOD® Reverb Tanks are high quality upgrade units. This makes the tanks less receptive to any outside interference. The original Hammond Accutronics tanks from the 1960s were also wired directly to their respective RCA jacks.